Oh how I love Lands’ End. When I think of them, I instantly think “warm and cozy.” For our next â€œ12 Days of Christmasâ€ giveaways, we are giving away a $75 Lands’ End Gift Card! Head over to Frugal Day on Facebook and click â€œshareâ€ on the giveaway post! Leave a comment and let me know what you’d buy with your gift card. Those down coats are always a fav of mine! Please use a valid email address, this is how I will contact the winner. Giveaway will end at 8:00pm PT on Tuesday November 22nd. One winners will be chosen randomly using â€œAnd the Winner Is:â€ a WordPress plug in. Good Luck! Open to US residence only. 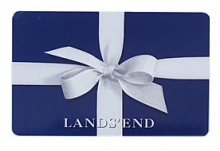 Giveaways Nov 19, 2011 in free, LandsEnd · Expired!